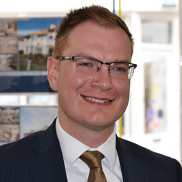 I started my career in 2016 at the Sidmouth Office of Bradleys Estate Agents. With a strong background in retail sales and customer service I seized the opportunity to train as an Estate Agent with such a reputable company, a long standing goal of mine. In 2018 I progressed and joined the excellent team in the Exeter North Street office. With stunning architecture throughout the city and plenty of things to do, Exeter is a wonderful place to live, work, or just visit. Outside of work I enjoy spending time with friends and family, keeping fit and going climbing. I also enjoy watching sports when I can.